The Taliban overran a base in northern Afghanistan, killing 17 soldiers yesterday. 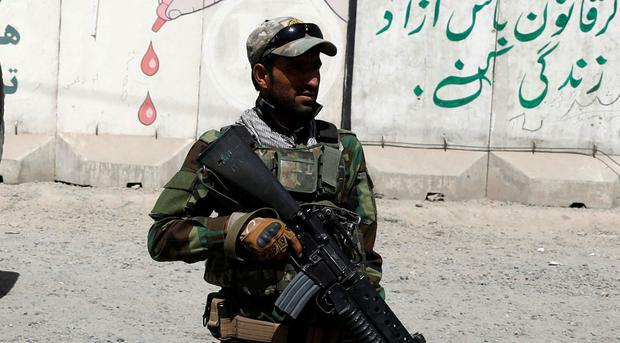 Afghan forces battled the insurgents for the fifth straight day in the eastern provincial capital of Ghazni, trying to flush them out of the city’s outskirts. It is believed the attack was a show of strength by the Taliban before possible peace talks. There have been signs that diplomatic efforts to kick-start negotiations are bearing fruit. Along with the troops killed in the attack in northern Faryab province, in the district of Ghormach, at least 19 soldiers were also wounded, according to defence spokesman Ghafoor Ahmad Jawed. The Taliban had besieged the base, which housed about 140 Afghan troops, for three days before the massive push late on Monday night, said the local provincial council chief Mohammad Tahir Rahmani. He said the base fell to the Taliban after the soldiers, who had resisted the three-day onslaught, failed to get any reinforcements and ran out of ammunition, food and water. Rahmani said 43 troops were killed and wounded. Taliban spokesman Zabihullah Mujahid claimed responsibility for the attack, saying 57 Afghan soldiers had surrendered while 17 others were captured in battle. He claimed eight military Humvees were also seized. Meanwhile, Afghan security forces pushed back the Taliban from Ghazni city and were trying to flush the insurgents from the city’s outskirts. The operations came on the fifth day after a massive Taliban attack on Ghazni. Hundreds of people have fled the fighting in the city, which has so far killed about 100 members of the Afghan security forces and at least 20 civilians. Nasart Rahimi, a spokesman for the Interior Ministry, said security forces were searching every inch of Ghazni for remaining Taliban fighters. Military helicopters were supporting the ground forces’ operations in Ghazni, said Abdul Karim Arghandiwal, an army media officer in south-eastern Afghanistan. Mujahid, the Taliban spokesman, denied the insurgents had been routed from Ghazni and said sporadic gun battles were still ongoing. The Taliban’s multi-pronged assault on the strategic city, about 120km from the capital of Kabul, began last Friday. The insurgents overwhelmed the city’s defences, pushing deep into Ghazni and captured several parts of it in a major show of force. The United States has carried out air strikes and sent military advisers to aid Afghan forces in the city of 270,000 people. The fall of Ghazni would be an important victory for the Taliban, cutting Highway One, a key route linking Kabul to the southern provinces, the insurgents’ heartland. The fighting brought civilian life in the city to a standstill, and also severely damaged the city’s historic neighbourhoods and cultural treasures. In Kabul, Nilab Mobarez, the secretary general of the Afghan Red Crescent Society, said her organisation was ready to go into Ghazni and help the wounded – both the civilians and the combatants.